Communications Minister Gilad Erdan harshly criticized US Secretary of State John Kerry on Monday, accusing Kerry of not being a fair intermediary in the peace talks with the Palestinian Authority (PA). On Saturday in Munich, Kerry threatened Israel with international boycotts if it did not accept his "peace proposal" with the PA, saying that "for Israel there’s an increasing de-legitimization campaign that has been building up... there are talks of boycotts and other kinds of things. Are we all going to be better with all of that?" Kerry's comments were seen as all the more galling given previous reports that Kerry himself is orchestrating the European boycotts. 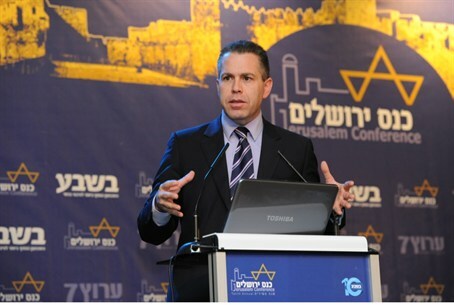 Erdan was speaking at Arutz Sheva's eleventh annual Jerusalem Conference. "Currently threats are still heard against citizens of Israel and they try to terrorize us. When we hear John Kerry and the American State Department, we think they are wrong in their analysis of what's happening in the Middle East," emphasized Erdan. This kind of balanced approach of warning both sides isn't seen in Kerry, who constantly "puts the pressure on the prime minister and the government of Israel," Erdan noted. Erdan added that while the US is an "important friend and ally," in this "harsh dispute" Israel doesn't intend to submit to the US plan to have Israel withdraw to the 1949 Armistice lines and create an Arab capital in Jerusalem. "Yes - we won't divide the land of Israel; yes - we won't divide Jerusalem, and our right to live in Shiloh and Beit El is no less than the right of the people of Israel to sit in Tel Aviv and Ramle and Haifa or any other place," declared Erdan, referring to two ancient Jewish towns in the Samaria (Shomron) region. In response to the American pressure, Erdan said Israel must stand firm, learning the lesson from the Oslo Accords and the "Disengagement" plan that expelled all Jews from Gaza and parts of northern Samaria. "We can't be afraid and we can't be shocked by the modernism and trends that appear to be directing us to only one solution," he declared, joining other right-wing politicians and academics in warning against the idea that the only alternative to a PA-ruled mini-state in Judea and Samaria was a "binational" or "one-state" solution which would end Jewish sovereignty in the land of Israel. "We have to continue to strengthen the Jewish education and the Jewish values that have guarded the people of Israel in their land for thousands of years, and it's important to do that while guarding the unity of the Jewish people," stressed the communications minister. Regarding Oslo, Erdan called the 1993 agreement an "historic mistake," noting that at the time as a Bar Ilan University student he led protests against the process. At the time, Erdan relates that the Israeli press "told us that peace was at the doorstep, which was apparently obvious, but the fact was that before our eyes was the involvement of (former PA Chairman Yasser) Arafat and his murderous gang of terror funding and incitement against Israel." Erdan's comments are just the latest in a series of criticisms of the US Secretary of State's attempts to force an agreement on Israel by senior Israeli government officials. On Sunday, Prime Minister Binyamin Netanyahu labeled the boycott threats "immoral and unjust".